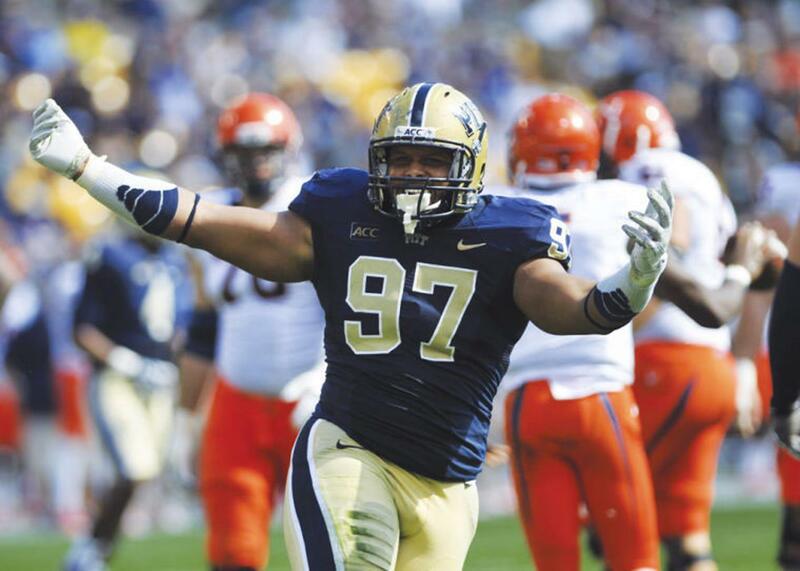 Before Aaron Donald was the NFL’s Defensive Player of the Year, he spent his Saturdays terrorizing college quarterbacks at Heinz Field. In the NFL, Donald has a reputation of being a hard worker and relentless competitor playing for the Los Angeles Rams. According to Chris Lasala, Pitt’s associate athletic director for football administration, the defensive lineman has always been that way. His work certainly paid off at Pitt, where he won the 2013 ACC Defensive Player of the Year award in his senior season. That year he also took home the Vince Lombardi award for Lineman of the Year, the Chuck Bednarik award for NCAA Defensive Player of the Year and was a consensus All-American. Donald went on a week-long awards circuit in December 2013. The trip lasted four days, and he arrived back at Pitt late in the night. He was given the next day off, but when the coaches arrived for practice, Donald was dressed in full pads, ready to go. Donald has been outstanding in the pros as well since being drafted in 2014. He has been selected for the Pro Bowl all four years he’s been in the league, and he earned first team All-Pro the past three seasons. He was the NFL Defensive Rookie of the year in 2014. This year, the Associated Press named Donald the NFL Defensive Player of the Year for the first time in his career. E.J. Borghetti, the executive associate athletic director for Pitt Athletics, remembers Donald as a consummate professional, even in college. Donald has been a general in the trenches for the Rams over the last four seasons, helping lead the team to its first playoff appearance since 2004 and its first winning record since 2003. On the field, it was evident to the Pitt football staff from the beginning that he was going to succeed. Borghetti recalled a conversation he had with one of Pitt’s offensive lineman during Donald’s first season. “Jason Pinkston, who himself went on to become an NFL offensive lineman, I can remember him remarking, ‘We’re going to have a hard time keeping him off the field. He’s going to be ready to play,’” Borghetti said. Off the field, that competitive nature spilled over into friendly games of ping-pong in the team locker room. Originally from Penn Hills, about a 20-minute drive from Pittsburgh, Donald showed talent and natural ability in high school as well. Pitt defensive lineman Aaron Donald sacks Virginia quarterback David Watford in 2013. He had 29.5 sacks in his Pitt career. Gibson said Donald hasn’t changed from the person he was in high school. Donald always jumps at the opportunity to return to Pitt, even with his professional life taking him to Los Angeles.